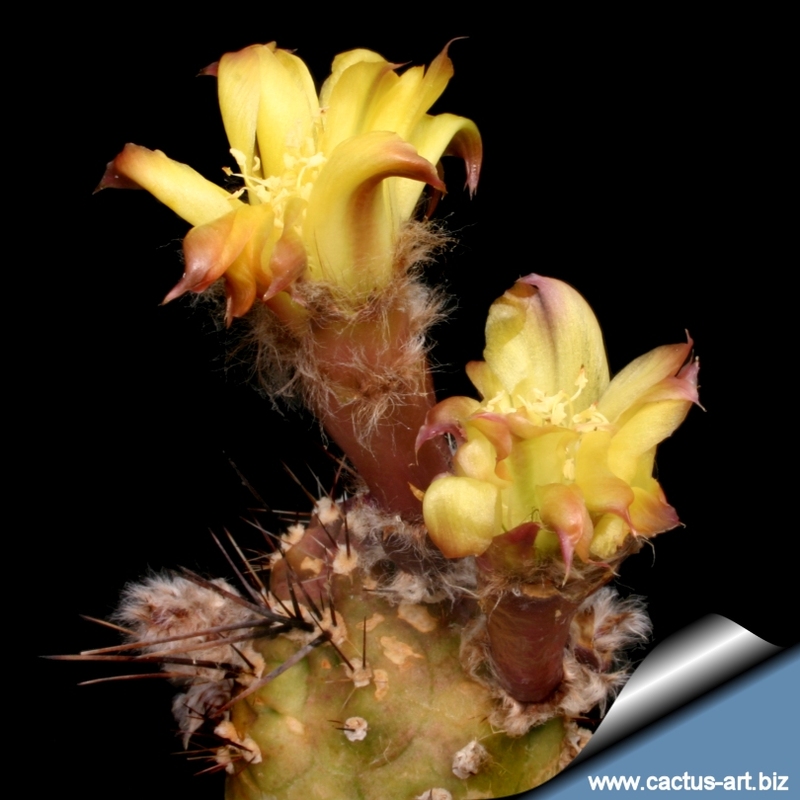 Lobivia aurea var. shaferii forma mostruosa. It is a heavy bloomer that start flowering when still very still very young and small. It has almost spineless ovoidal stems that branches profusely and grow up to 30 cm tall. 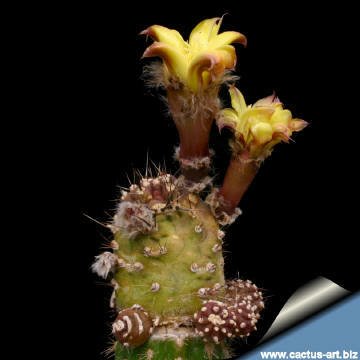 Lobivia aurea var. 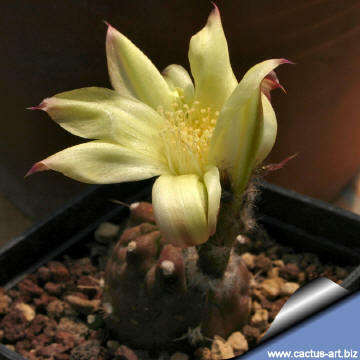 shaferi "mostruosa"
Description: The standard L. aurea v. shaferi is a very spiny cactus. The monstrous form here described is a quite different almost spineless clustering plant with ovoidal growth habit that branches profusely and can slowly grow up to 30 cm tall. Stem: Composed by upright sections that branches avidly up to 3-8 (-10) cm tall by 3-5 cm in diameter, bright-green to dull olive-green with purple hues in full sun, with only a few areoles with a short white wool. 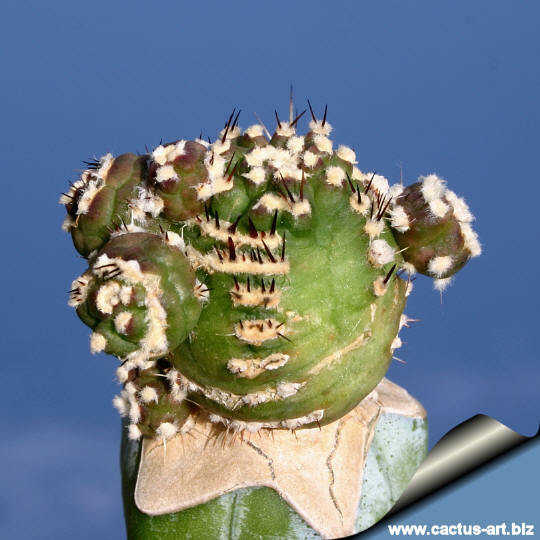 The areoles are arranged irregularly and often are fused to form peculiar horizontal lines contrast with the stem. 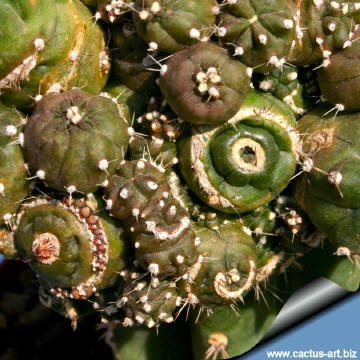 Spines: Few honey-coloured to brown with darker tips, located on the few areole in groups. They can grow up to 4–25 mm long. Flowers: Yellow and monstrous looking with short curled petals and an orangish floral tube. 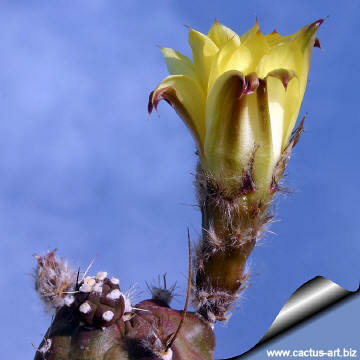 The flowers are yellow and monstrous looking with short curled petals and an orangish floral tube. The areoles are arranged irregularly and often are fused to form peculiar horizontal lines contrasting with the stem. 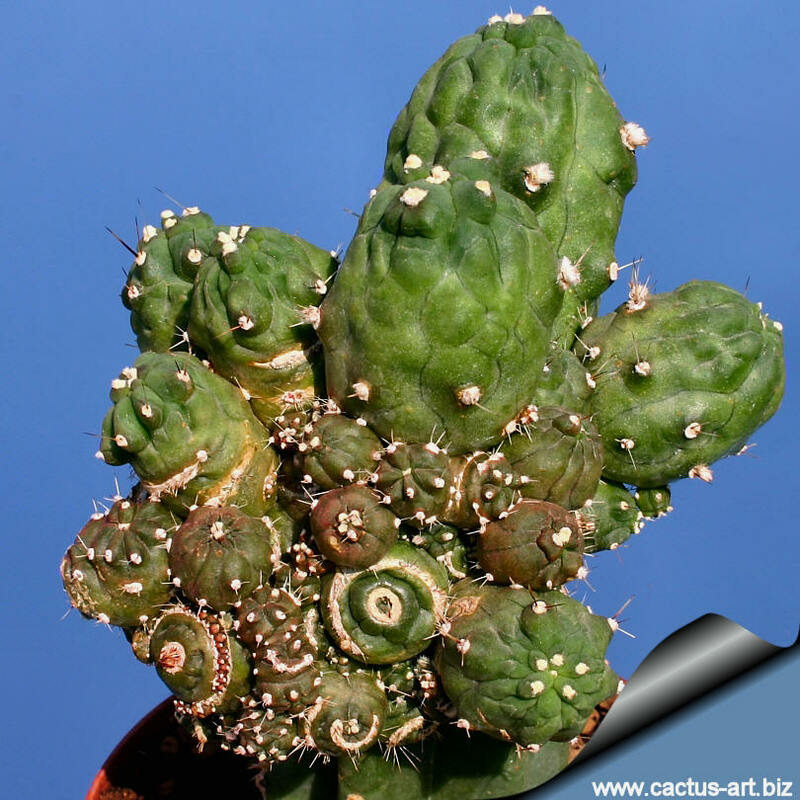 Cultivation: It is a summer grower species that offers no cultivation difficulties. Water regularly in summer (but do not over water it) It is rot prone and should be planted in a shallow pot. As most Echinopsis cultivated for their blossom, it needs a soil mixture a little richer than the average cactus with still an excellent drainage, keep rather dry in winter. 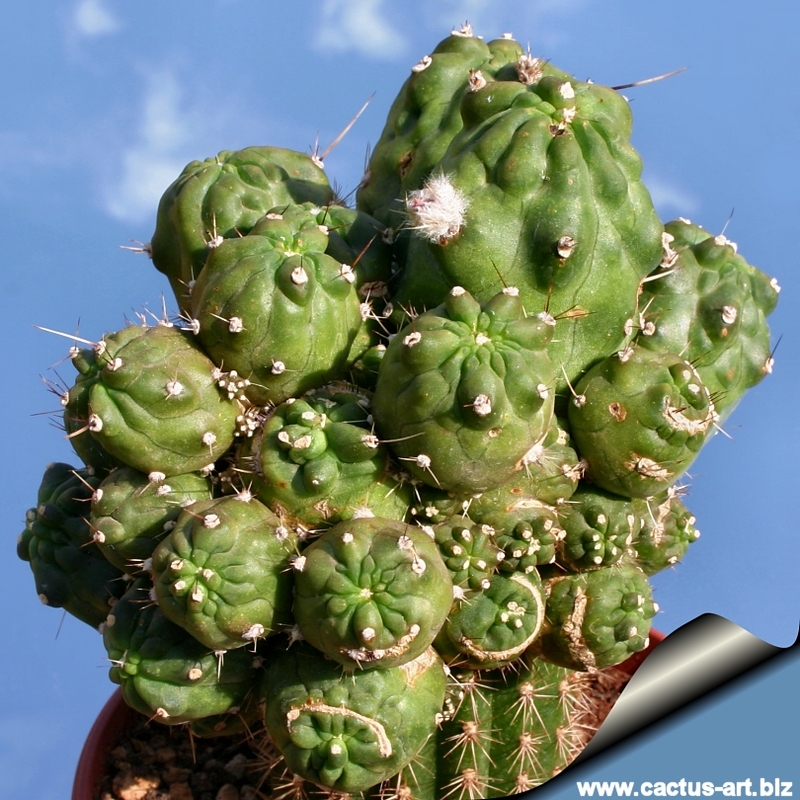 It is quite frost resistant if kept dry (hardy to -5° C Outside full sun or afternoon shade, inside needs bright light, and some direct sun.